GYEON Q2M Polish 1000 ml. Home > Shop By Brand > GYEON Car Care > GYEON Q2M Polish 1000 ml. For that perfect, hologram free finish and intense deep gloss! GYEON Q2M Polish is a low-dusting, high-quality polish that will finish off your paint correction detail with superior results. 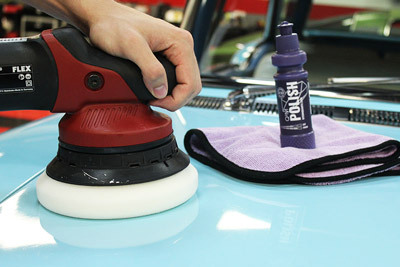 Most commonly used as a follow up product to GYEON Q2M Compound, this fast acting polish can be used with a Rotary or Dual Action polisher and in most cases eliminates the need to use a finishing product, thanks to the high-quality finish left behind. Also perfect for use as a one-step product, GYEON Q2M Polish is a super versatile addition to your detailing kit. Use GYEON Polish as a second step in your paint correction detail to refine your surface, or as a stand-alone, one-step polish! Perfectly clear, shining paint starts with using the correct products. If you have a sub-par polish that leaves traces of oils, smudges, and leftover correcting marks, you will not be able to achieve that perfect paint. GYEON took this in account during the manufacturing process with their Q2M Polish, and the results were tremendous. With a light cutting ability, but a high finish, GYEON Q2M Polish has made a name for itself as a two-in-one paint correction product. For light to medium paint correction, GYEON Q2M will remove the imperfections, and finish to a high shine – in just one application! With a cut rating of 4/6 and a 5/6 finish rating GYEON Q2M will always finish a surface effectively and without repeated applications. Whether you’re using GYEON Q2M Polish as a follow-up polish to GYEON Q2M Compound, or just using it as a paint refreshment, the results will always be stunning. GYEON Q2M Compound 1000 ml. GYEON Q2 Pure 30 ml.GYEON Q2 Pure 50 ml.GYEON Q2 One 30 ml.GYEON Q2 One 50 ml.GYEON Q2 SyncroGYEON Q2 Mohs Ceramic Paint Coating - 30 mlGYEON Q2 Mohs Ceramic Paint Coating - 50 mlGYEON Q2 Matte 50 mlGYEON Booster - 30 mlGYEON Q2 CanCoat - 200 mlGYEON Q2 Trim - 30 mlGYEON Q2 Rim - 30 mlGYEON Q2 View - 20 mlGYEON Q2M Compound+GYEON Q2M Compound+ 1000 ml.GYEON Q2M Compound 120 ml. GYEON Q2M Compound 1000 ml. GYEON Q2M Polish 120 ml.GYEON Q2 Primer 120 ml.GYEON Q2 Primer 1000 ml.